I designed this bear as my christmas gift to the knitlist for 1998. You can kit him/her with any yarn you like, using needles that give you a very firm gauge so that the filling does not show through the fabric. Add an i-cord tail and embroidered whiskers and you have a cat! I used 60gm 8 ply (DK) Patons Fireside in dark brown @ approx 95m (110 yards) per 50gm ball and 3.25mm needles. My tension was 26sts and 52 rows to 4 inches over garter st on 3.25mm needles. Bear is knit entirely in garter st.
Beginning at the top of the head, cast on 40sts and knit 32 rows. Place a coloured thread in the middle (approximately) of the last row to show where the neck is. Put a coloured thread at each end of the last row to show where the body stops and the legs start. Knit a further 39 rows on these 20 sts. Cast off. With right side facing, rejoin yarn to the other 20sts and knit 40 rows. Fold the body in half and sew the back seam from the cast on edge to the row where you placed markers for the top of the legs. Refold the body so that the seam you just sewed runs down the centre of the back and sew the inside leg and foot seams. Stuff your teddy lightly and sew the top of the head closed, rounding the corners very slightly. 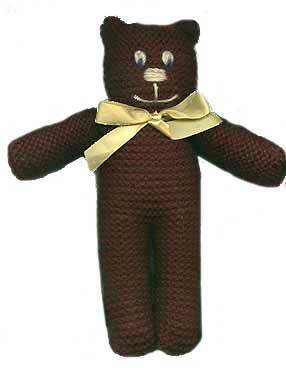 Sew across the corners of your teddy’s head so that the corner points form ears. If you want your ears to stand out like those in the picture, gather around the bottom of each ear and pull slightly. Gather around the neck on the row where you placed the marker for the neck. Fold the arm pieces in half and sew the side and one end closed. Stuff very lightly, sew the remaining side closed and sew the arm to the body, just below the neck. Put a ribbon around the neck and embroider face. When sewing ears, do not round off the corners. Knit a length of i-cord and sew to the back of the toy, just above the top of the legs, for a tail. Embroider the face as for the bear, but add whiskers. This pattern is Copyright © Sarah Bradberry September 22nd 1998, all rights reserved.